There are many reasons why we recommend a crown. The most common reason is structual weakness in the tooth from a large filling or fracture. When teeth have large fillings, or they have broken in the past, the structural integrity of the tooth has been compromised and it is prone to more fractures. 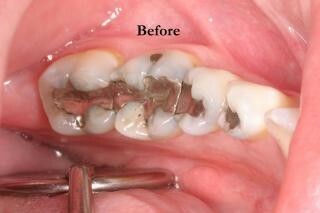 Teeth with large fillings can often break so badly that we are unable to fix them and must be extracted. To prevent this, we remove the outer layer of the tooth and replace it with a crown. The crown encases the tooth and the filling and prevents further fractures. Occasionally a patient will present with discomfort to biting on a tooth which can be a sign that the tooth is getting ready to break. Other times we see fracture lines in the surface of the tooth and recommend a crown before the tooth fractures. Here we see several teeth with old amalgam restorations. The second tooth from the left required the placement of a crown due to the size and depth of the filling. The other teeth were restored with tooth colored fillings. 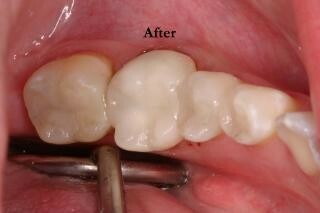 The same patient as above with the new crown and tooth colored fillings in place.